Galvanic corrosion, often misnamed "electrolysis," is one common form of corrosion in marine environments. It occurs when two (or more) dissimilar metals are brought into electrical contact under water. When a galvanic couple forms, one of the metals in the couple becomes the anode and corrodes faster than it would all by itself, while the other becomes the cathode and corrodes slower than it would alone. Either (or both) metals in the couple may or may not corrode by itself (themselves) in seawater. When contact with a dissimilar metal is made, however, the self-corrosion rates will change: corrosion of the anode will accelerate; corrosion of the cathode will decelerate or even stop. 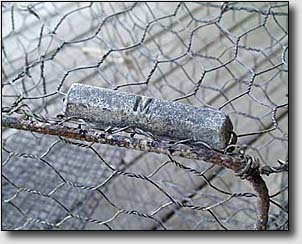 Smart watermen know this fact and employ the use of sacrificial zinc anodes on their zinc-galvanized metal crabpots. With the sacrificial anode attached, the crabpot becomes the cathode. The result is that the anode will corrode (hence "sacrificial") and the crabpot won't. This effectively doubles the life of the crabpot.